In December, the Wall Street Journal reported that coworking startup WeWork had leased around 1.6 million square feet of office space in New York. This made it the fastest-growing company by footprint in New York since 2010. 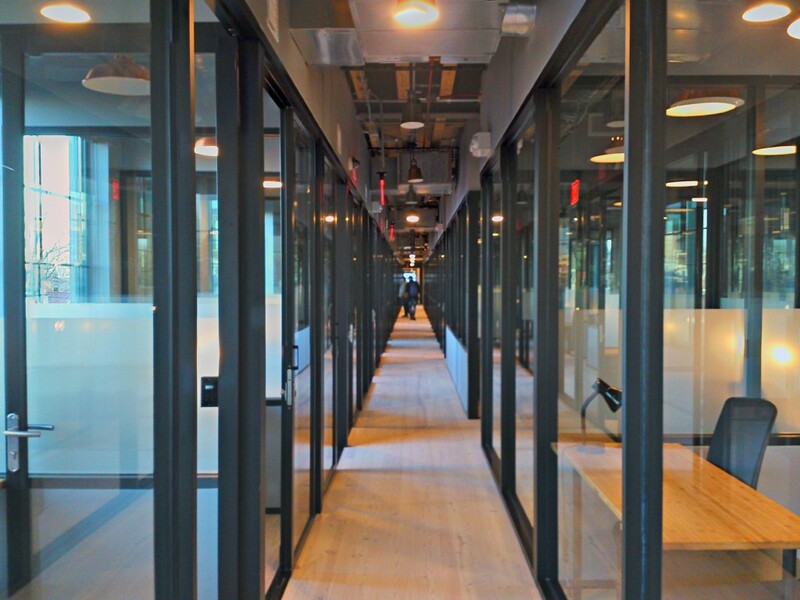 In the months since then, WeWork has added nearly another half-million square feet. “We take large spaces and cut them up into smaller spaces,” WeWork co-founder and CEO Adam Neumann said in a TechCrunch Disrupt Q&A from earlier this week. The business is much more complicated than that, of course: It offers free beer at all of its spaces; there are couches, where people from all walks of life (who are members of WeWork) can talk to each other; and there’s an app, a kind-of social network for members. In December, the four-year old WeWork closed a $355 million funding round at a $5 billion valuation. “It’s almost like you’re a real estate company wrapped in this tech sheen,” Bloomberg Television’s Betty Liu pointed out in an interview with Neumann and early WeWork investor Mort Zuckerman, of Boston Properties, in February. “There is no real estate company that can become worth five billion dollars in four years,” Neumann demurred. In other interviews, Neumann emphasizes the WeWork app as much as the WeWork space itself. “We don’t have tenants, we have members. It’s a month-to-month licensing agreement, we’re not actually looking for long-term commitment,” he said. A couple of months later, in April, WeWork signed a nineteen-year lease for the entire fourth through seventeenth floors — 180,000 square feet — of 1460 Broadway in Midtown. The same day, WeWork signed a fifteen-year lease for 140,169 square feet — all nine floors — at 315 West 36th Street in Midtown West. The more conventional real estate world admires WeWork’s rapid rise, but scoffs at its pretensions to being something other than it is. “It’s not original in concept: they’re executive suites. They’ve built on everyone else’s successes, and taken it a step further,” Jeff Nissani, a commercial broker at Marcus & Millichap, told me. Asked what their impact on the market has been, Nissani deemphasized WeWorks effect on rent rates. “Their impact is that it’s very difficult for other executive suites to compete. Because they’ve capitalized so well, they can offer a much higher-end build-out.” And, in turn, they can charge more for the space they provide: According to WeWork’s website, tenants at the space on Broad Street will pay from $750 per month for a one-person private office to $3,900 per month for a six-person private office. It is a convenient idea, this “We Generation.” It refers to a category of people united across all boundaries — space time, race, class, gender — by the illusory notion that we are all working and living for each other, and that somehow this notion is inherently compatible with the demands of investors, the market, and capitalism. The logical conclusion of WeWork’s vision is to expand into the residential market — to break down the boundaries between residential and commercial. This is already happening: landlord and developer Vornado Realty Trust is redeveloping a building for WeWork in Washington, D.C.’s Crystal City neighborhood that will include both residential and office space. “Landlords briefed by WeWork on the concept liken it to a dorm for Millennials in their 20s,” the Wall Street Journal reported. WeWork wants to control the space in which every significant aspect of a certain kind of person’s — the We Generation’s — life takes place. One employee, who requested anonymity because talking to the press about WeLive is expressly forbidden by the company — “a higher up who did so was half-jokingly publicly shamed at the corporate summit” — told me, “They see themselves as Uber for space.” This person added, “They want to destroy the work-life barrier.” Imagine: You are a WeWork member, a graphic designer, maybe, or a serial entrepreneur. You have friends and colleagues and clients — what’s the difference, really — all over the country, or maybe even the world, and you can travel between WeWork’s residential office spaces to see them all for a few days, weeks, or months at a time, without ever leaving the comfort of your coworking home. Wherever you go, there We are. Living. Working. Weing. In the Bloomberg Television interview, Zuckerman made it clear that he doesn’t think WeWork getting into residential is the best idea. Neumann is “the master of this new kind of office space,” Zuckerman said. “I would concentrate on that.” Then, he added, “When he has grey hair, then tell him to move into residential.” Neumann just smiled in response. Correction: This piece previously stated some of WeWork’s yearly rates as monthly. We regret the error.